Never Enough Nails: Sephora By OPI Fall 2010 Preview!! So I know I still owe you Part Two of the Zoya Wonderful Collection, but the weather didn't cooperate with my schedule, so those will have to wait until tomorrow. "Inspired by the iconic attitude that is pure rock, the Sephora by OPI Rocker Chic collection adds a edge to the typical neutral tones seen every fall. Defined by rock music’s empowered, impassioned and addictive sound, Rocker Chic is tough and trendy, leather and lace, offering a shade for all audiences. The collection translates into fall’s must-have “neutrals with a twist” – statement-making browns, from sienna to chocolate-cherry, pops of metallic and deep purples, wines and red." I'm most excited for Just a Little Dangerous, Club Scene Queen, and Already Famous. All nine colors sound right up my alley though!! What do you think about these colors? 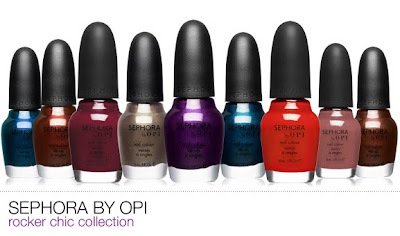 The Sephora by OPI Fall 2010 Rocker Chic Collection will be available online at Sephora in August 2010. Edit- these are available now!!! Check them out! Also, that online exclusive glittery blue sounds like it's going to be MINE! I've already ordered dating the drummer! I had to have that one since I did date one for many years before we made it official. Oooooh brown with a little holo shimmer??? Sounds like that one might go on my list also! Jackie S- They do, don't they? I like that they included some bright colors in a fall collection. It's hard to go straight from neon pinks to blackened blues and reds.